The Peninsula Humane Society & SPCA (PHS/SPCA) decided to have a little fundraising fun and invites everyone to participate in their Fantasy Furball fundraiser which starts today and will run until August 8th. Eight animal themed teams will battle in a head to head showdown until only one is left standing to win it all. The Fantasy Furball fundraiser begins online July 31st and ends August 8th. Team scores are counted through donations to each team and the winning team will receive all the donations to their respective program. 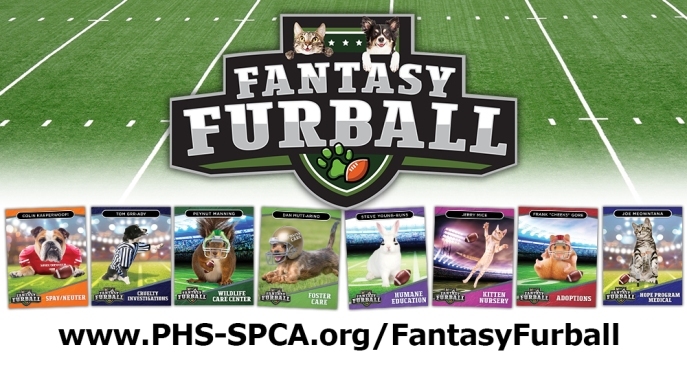 The Peninsula Humane Society & SPCA invites everyone to participate in their Fantasy Furball fundraiser which starts today and will run until August 8th.Eight animal themed teams will battle in a head to head showdown until only one is left standing to win it all. “Not only is this a fun way to raise money for local animals, it’s also a way to help highlight some of the programs we provide the community that many may not be aware of,” according to Tarbox." For more information about Fantasy Furball and to make a donation, please visit.